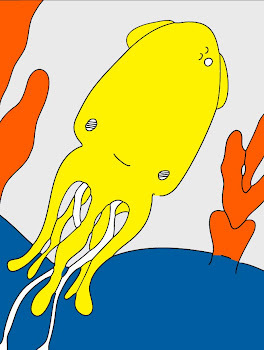 Technicolor Squid: We’ve Lost Contact. Well, we had an extremely quick winner for the silly “comment about the tree” competition (who has been notified) and a little prize will be sent out shortly. Yippee! More information on this in the coming weeks I hope. I am hoping for a more official unveiling of my latest addiction (read: craft obsession) soon! In other news, I guess that my contacts liked living in my eye even less than I liked having them there, because they both attempted suicide today. The right lens, however, succeeded in it’s morbid quest, after it jumped out of my eye and landed goodness knows where. I remained completely unaware until I tried to remove it several times tonight without success. The only thing that made me even begin to suspect this tragedy, was that my right eye felt far more comfortable than my left throughout the evening. Later, my left eye became extremely uncomfortable however, in what I can only assume was heartbreak due to the loss of it’s mate. P.S. I know that the title of this post is another bad attempt at wit. The subject of this post is completely apparent to you smart little cookies. I apologize. It is obvious that I need to take baby steps (probably at least twelve of them). Besides, I had better remember to tread lightly, one of my contacts might be on the ground.